CHARLESTON, WV — West Virginians are outraged after learning that Attorney General Pat Morrisey joined a federal lawsuit to allow insurance companies to deny coverage for people with pre-existing conditions. Today, Joe Manchin’s campaign launched an online petition to give the people of West Virginia the chance to speak out. 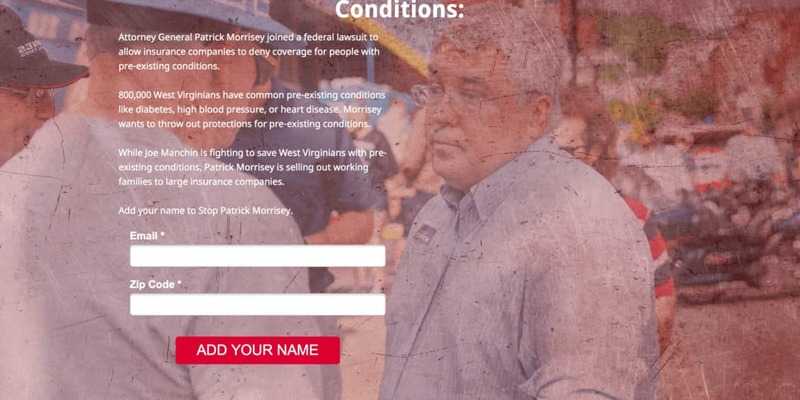 West Virginians can visit StopMorrisey.com to speak out and add their name to a petition to stop Pat Morrisey. 800,000 West Virginians have pre-existing conditions like diabetes, high blood pressure, asthma, or heart disease, and Patrick Morrisey is siding with the big insurance companies to throw out protections for West Virginians who have pre-existing conditions.